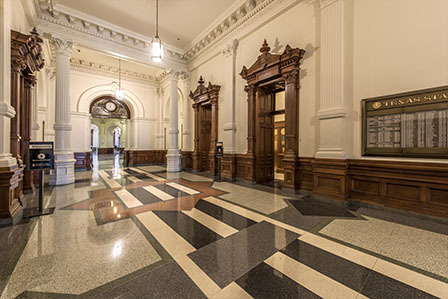 The South Foyer has served as the primary entrance to the Capitol since the building first opened, June 2015. The first floor of the Rotunda is a popular location for photographs, June 2015. 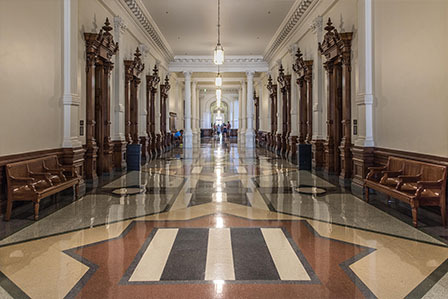 The Capitol corridors showcase the building's elaborate and intricate woodwork, June 2015. 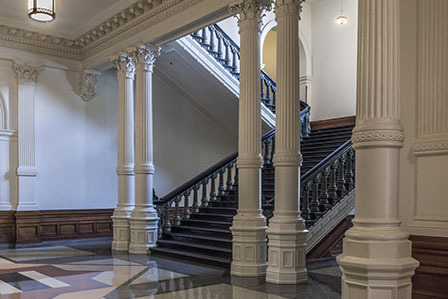 The Capitol's monumental staircases highlight the grandeur of the Capitol, June 2015. 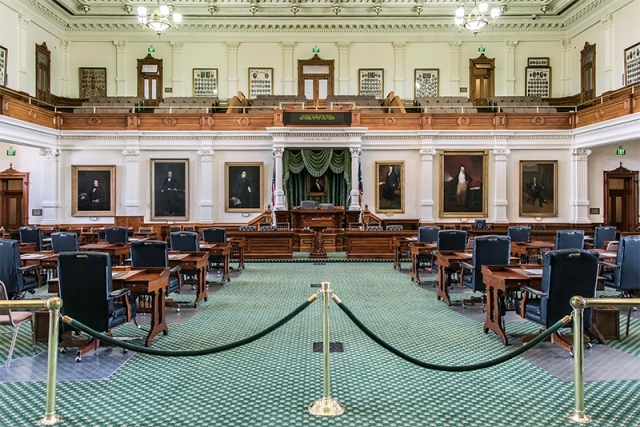 The Senate Chamber displays some of the most significant artwork in the Capitol Collection, June 2015. The House of Representatives Gallery allows citizens the opportunity to view legislative proceedings, June 2015. 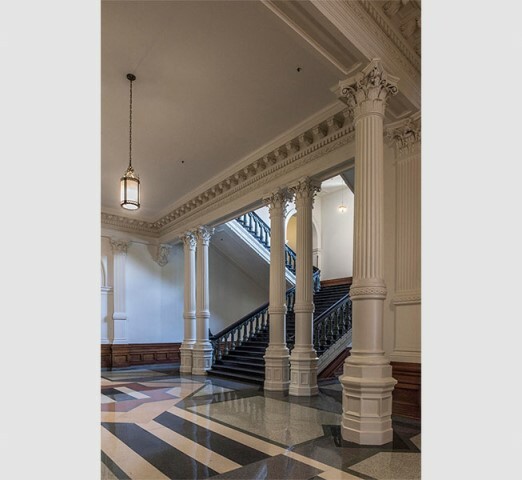 Elevators in the north wing provide access to all four floors of the historic Capitol and two levels of the Capitol Extension, June 2015. 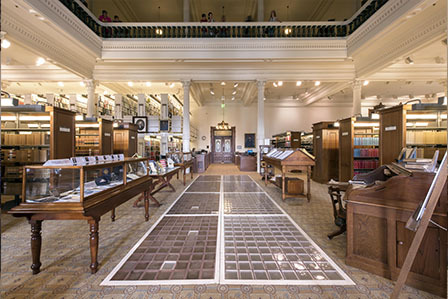 The Legislative Reference Library located in the second floor north wing features an impressive collection of resources on state government and is open to the public, June 2015. 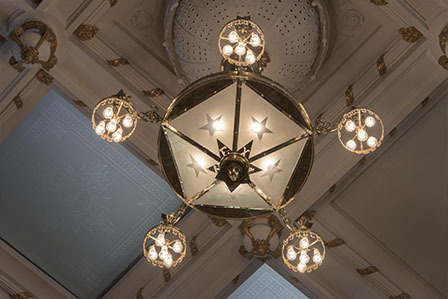 This chandelier in the House of Representatives Chamber dates to the early 1890s, June 2015. 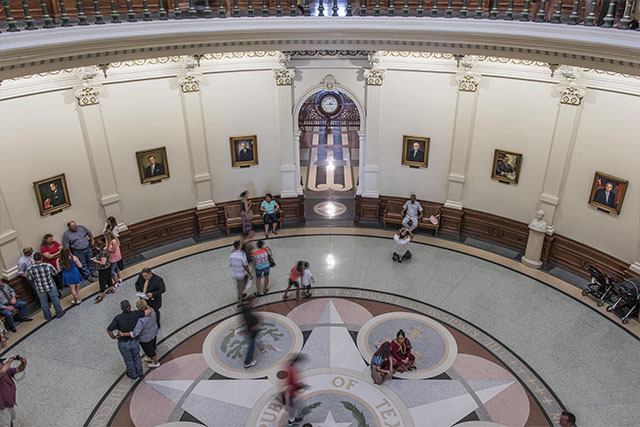 The grandeur of the Capitol Rotunda from the third floor, June 2015. 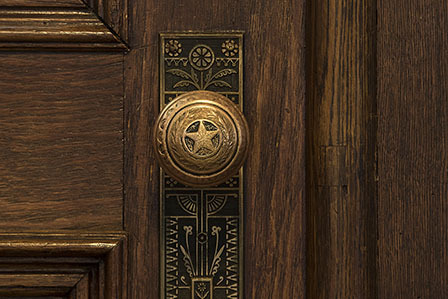 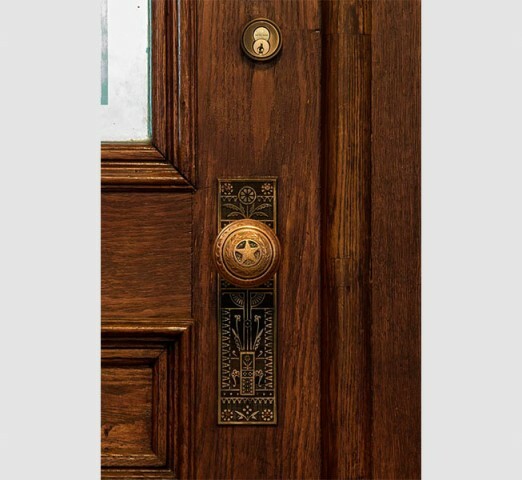 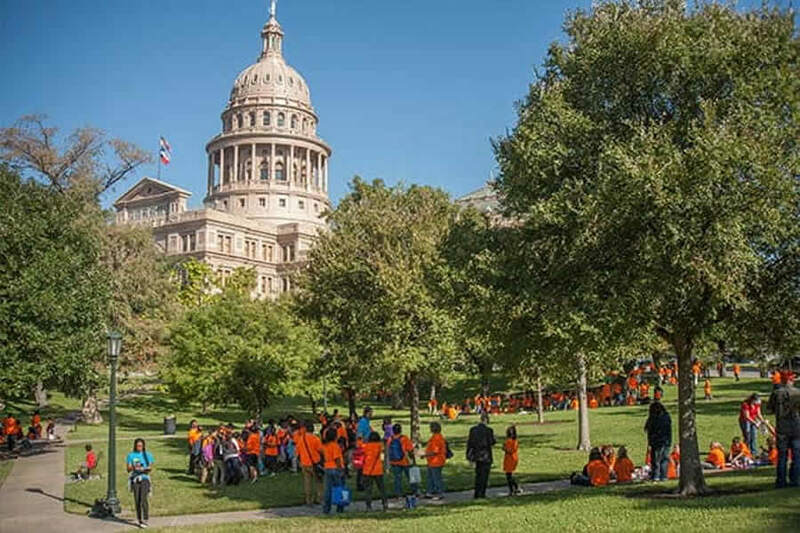 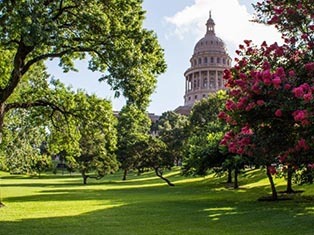 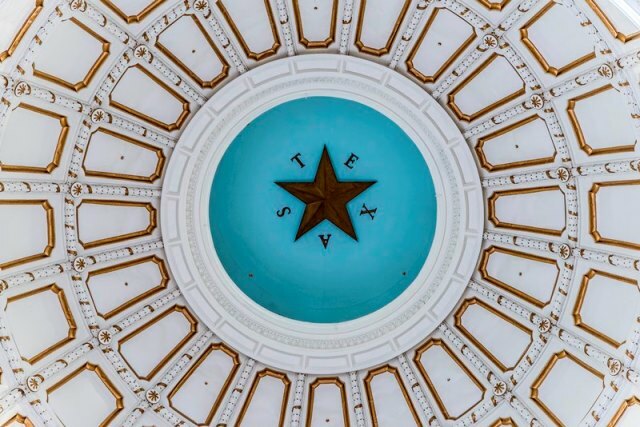 The Lone Star doorknob reveals the detailed craftsmanship of the Capitol, June 2015. 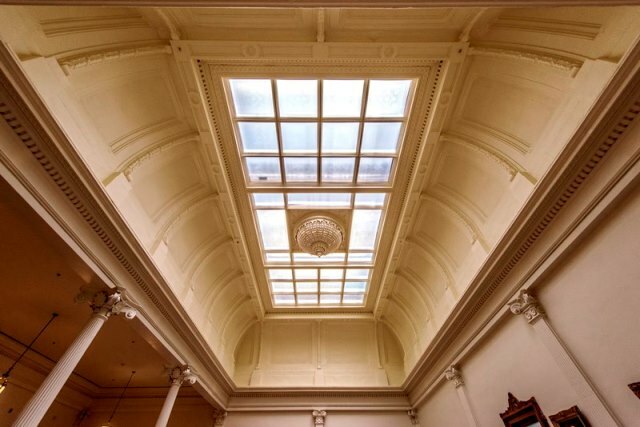 The skylight above the north wing exemplifies the Capitol's open architecture and use of natural light, June 2015. 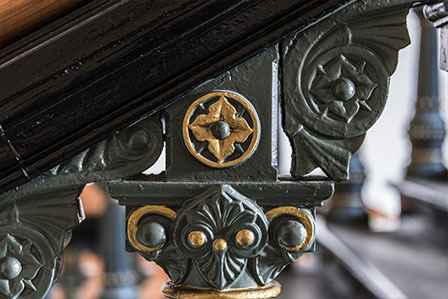 The monumental staircases feature intricate detail on the railing, June 2015. The north wing atrium permits light from the skylight to reach multiple floors, June 2015. 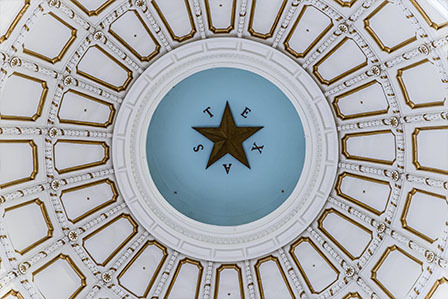 The star inside the dome stands 218 feet above the floor of the Rotunda and measures 8 feet from point to point, June 2015. 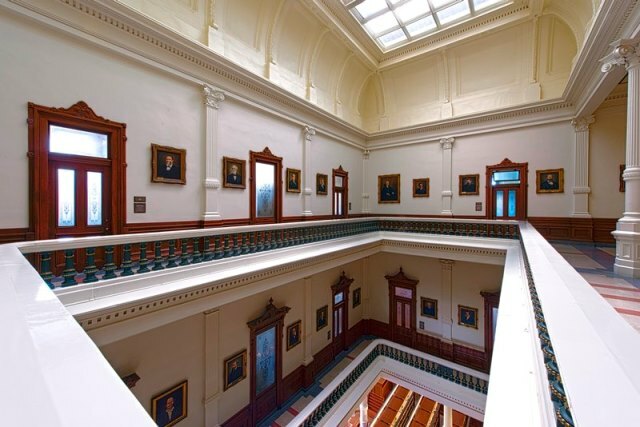 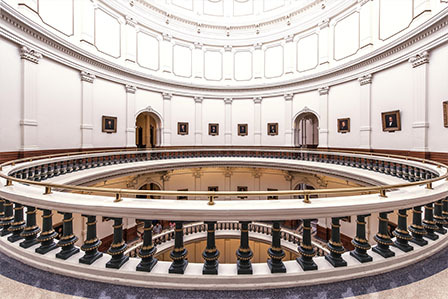 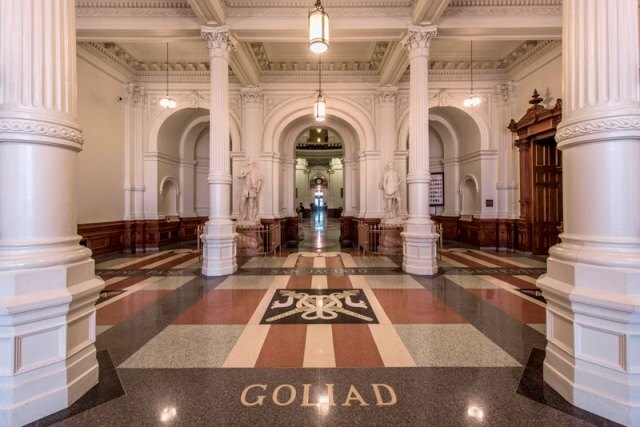 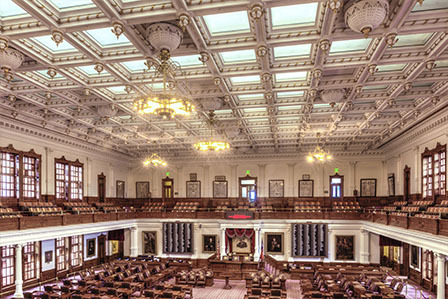 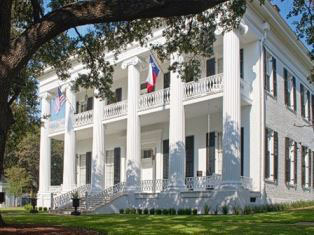 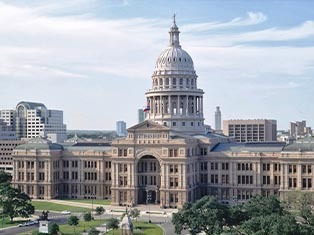 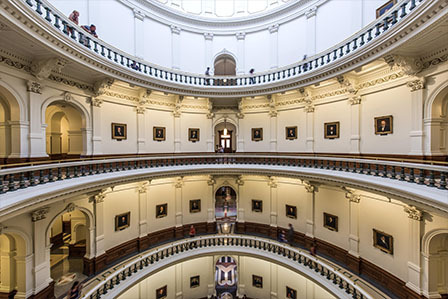 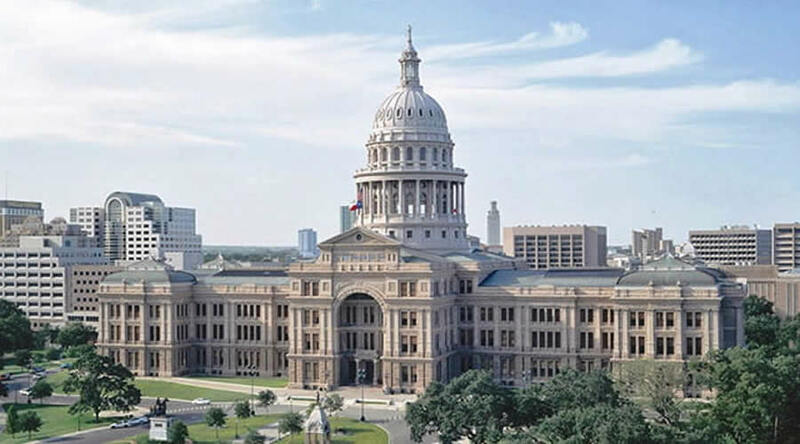 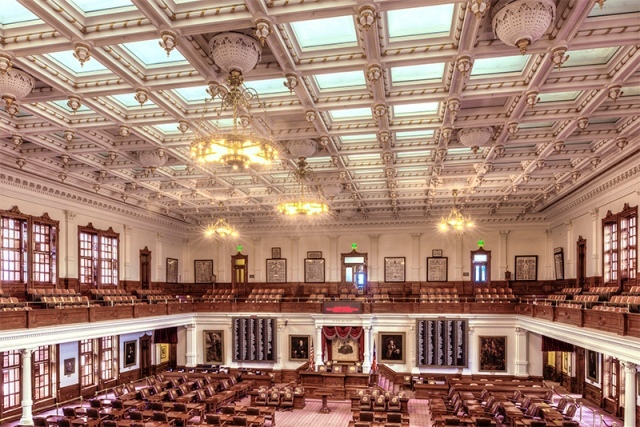 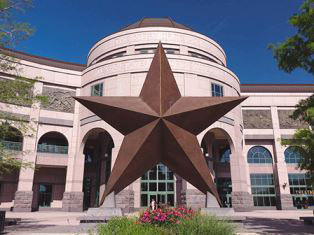 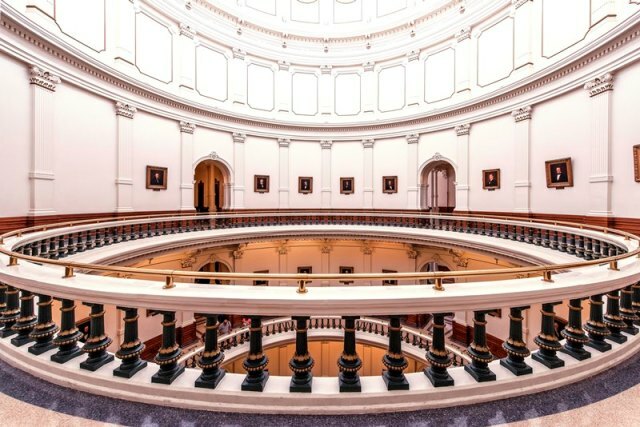 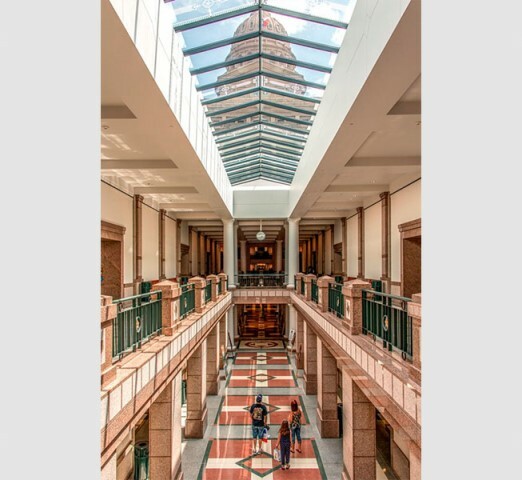 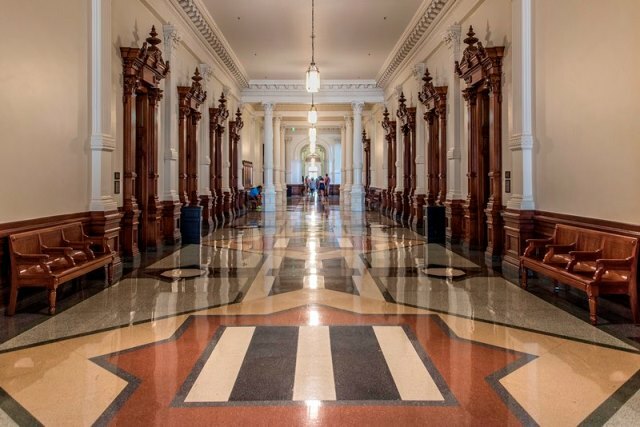 Portraits of past presidents and governors of Texas line the Rotunda displayed chronologically with the oldest on the fourth floor and the newest on the first floor, June 2015. 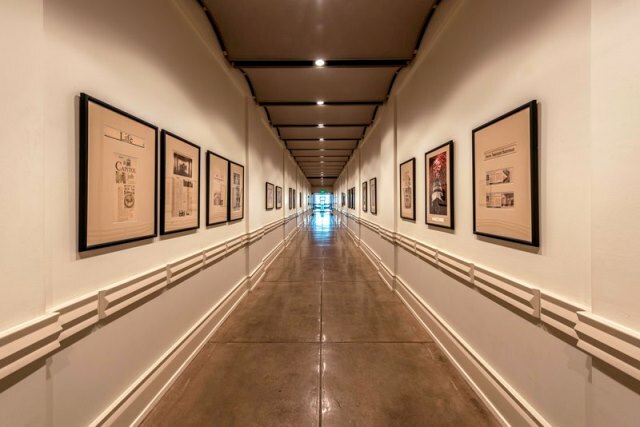 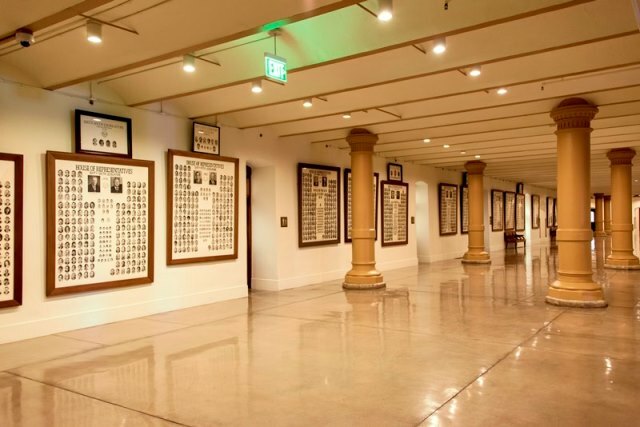 Framed composites of past legislatures line the corridors of the Ground Floor, June 2015. A pedestrian tunnel leads from the elevators to the remainder of the underground Capitol Extension, June 2015. 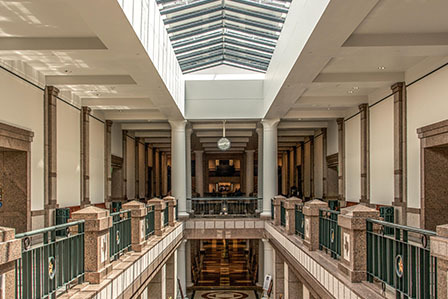 The numerous skylights in the Capitol Extension create an open feel despite the fact the structure is located underground, June 2015. 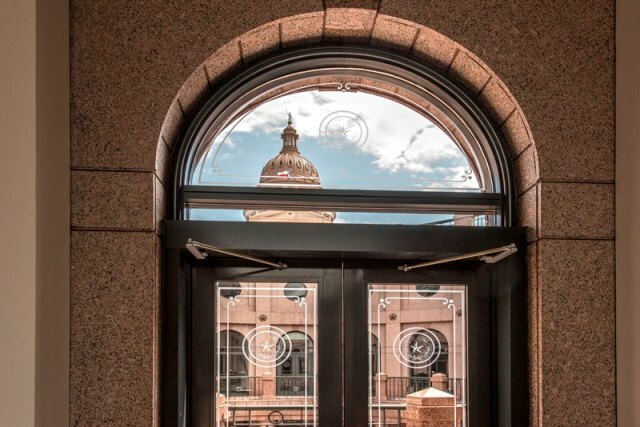 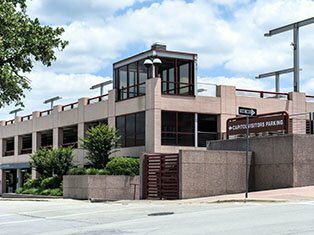 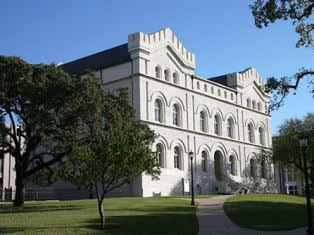 Windows surrounding the Seal Court in the Capitol Extension offer spectacular views of the historic Capitol, June 2015.